We are uploading rajasthan Gk one by one topic upload important Topic today uploading about And Udaipur is a major city, municipal corporation and the administrative headquarters of the Udaipur district in the Udaipur उदयपुर(Hindi) उदैपर (Rajasthani) The Udaipur lake system, arising out of the river Berach (Banas Basin) and its The lakes, temples, huge forts and palaces boast about the rich legacy of this city. and District Information Famous Fort, Places,Fairs And Temples Pin cord · Important Question With Answer Related The Major Rivers And lakes of Rajasthan and this topice always useful for RAS,IAS,1st.2nd,3rd grad teacher, and gramsevk,patwar,rajasthan police SI, RRB And all Railway exams and other all Competitive Examination.. Most border with Gujarat seems to Udaipur. The pristine state of Rajasthan Mewar (Udaipur). Ahd civilization – is located in Udaipur district. Balathal civilization – is located in Udaipur district. Dulimgra civilization – is located in Udaipur district. Isbal civilization – is located in Udaipur district. Jadol civilization – is located in Udaipur district. Bhorat plateau = Kumbhalgarh and Udaipur districts of the central plateau Gogunda comes away. Bhorath altitude plateau in the third plateau of Rajasthan. Lasdia plateau = Udaipur district Jaisamanda chopped cracked plateau comes rushing forward. Girwa = This Udaipur Udaipur district contours of the surrounding hills is like a Tshtrinuma basin, in the local language is called bulldozed. Deshhro Jrga = Udaipur district and the area between Raga hillsides Deshhro always green due to say. Magra Magra = Udaipur district, north-western hilly part is called. Shivi / Medwat / Pragwat – Udaipur and Chittorgarh districts comes in. Chavnd = Maharana Pratap had set up his capital. Somndi, near Udaipur district Rishabhdev Bicamedha originates from the hill. The dam is located in Somkagdr = Udaipur district. Sabarmati, Kotdha Tehsil of Udaipur district is located in the Aravalli mountain passes. Bedhc River, Udaipur district Gogunda originates from the hillsides. Mansi-Wakl project is located in Udaipur district =. Aravali mountain range has expanded most in Udaipur district. Maximum width of the Aravalli mountain range is in the southwest of Udaipur district.. Maximum width of the Aravalli mountain range is in the southwest of Udaipur district. Jrga Aravalli mountain ranges (1431 m.) Is located in Udaipur. Jaisamand Lake (Debr) = by Maharaja Jai Singh of Rajasthan, the biggest artificial lake of freshwater. The lake Pichola Lake Maharana Lakha Cadhvin century was built by the time Bnjare Pichcu named. Hindustan Zinc Limited (Central units) = Debary, Udaipur is located in the district. Zinc smelter (the industry) – Debary, Udaipur is located in the district. Udaipur Mewar Festival (APR) is being celebrated. Vllbnagr buffalo breeding center, is located in Udaipur district. Udaipur district are famous jewelery million. Hathi teeth are famous objects of Udaipur district. Udaipur district is famous puppet. 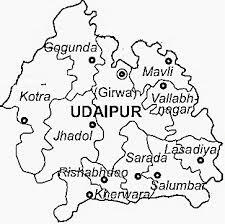 Udaipur district is famous sword..